17" Ryzen and Radeon Powered Gaming A portable all AMD Machine, built with the latest Ryzen 5 Processor and a Radeon 560X series GPU. The FX705 allows for faster, more efficient multitasking, including daily productivity tasks, surfing the net, and watching movies and videos. The Ryzen processor which has quad cores and eight threads and is capable of speeds of up to 3.7GHz. It’s also tested and certified to military-grade MIL-STD-810G standards, successfully surviving varying conditions including solar radiation exposure, high altitude, and temperature extremes, guaranteeing toughness and durability that’s second to none. A Complete AMD Performance Package Imagine a compact gaming laptop that punches well above its weight, that’s what FX705 AMD Edition brings to the party. It’s powered by the latest AMD Ryzen processor, which has quad cores and eight threads capable of speeds of up to 3.7GHz. And it’s not just for gaming, FX705 AMD Edition allows for faster, more efficient multitasking, including daily productivity tasks, surfing the net, and watching movies and videos. Paired with Radeon RX 560X graphics, you can rest assured that FX705 AMD Edition is up to the task, inside and outside the gaming arena. EXTREME IMMERSION ON AN ULTRAFAST DISPLAYThe new NanoEdge design has a slimmer-than-ever 7.18mm bezel for extremely engaging visuals in a much more compact package. FX705 AMD Edition features an ultrafast IPS-level panel for supersmooth gameplay with minimal motion blur. Wide-view technology ensures consistent colours when you’re viewing the screen from extreme angles. HYPERCOOL TECHNOLOGY IMPROVES DURABILITYASUS-exclusive HyperCool technology consists of the Anti-Dust Cooling (ADC) system and HyperFan to ensure exceptional cooling during gaming marathons. Cooling is also improved by the patented trapezoid-cut lid and intelligent parallel fan placement.With optimized cooling from the dual fans which increase thermal efficiency by up to 25%. With 3 settings: Silenced, Balanced and Turbo mode you can adjust the cooling to suit your current situation. Ramp up the fans in heavy load gaming sessions to keep optimal performance and slow things down when you're not demanding computing power. Precise keystrokes with HyperStrike Technology Optimized for gaming, the Desktop Inspired Keyboard with red backlit LEDs has exclusive HyperStrike technology that ensures more accurate typing and improved ergonomics. It includes a highlighted WASD key group, broader space bar, isolated arrow keys, and recognizable gaps between the function keys. Working with that the Overstroke technology registers keystrokes faster and more precise so that you are always in control. I/O PORTS WITHIN EASY REACHFX705 AMD Edition features a host of I/O ports including a single USB 2.0 and two USB 3.1 Gen 1 Type-A ports for your gaming peripherals, as well as HDMI 2.0 to connect to an external display. All ports are situated on the left side of the laptop so there's nothing to interfere with right-handed mousing. 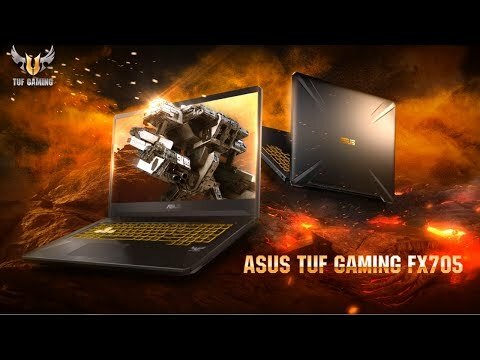 TESTED TO BE TOUGHER THAN STANDARDInfused with the spirit of The Ultimate Force (TUF), FX705 AMD Edition has passed a series of rigorous military-grade MIL-STD-810G durability tests, successfully surviving varying conditions including solar radiation exposure, high altitude, and temperature extremes. It's certified to endure day-to-day use, from accidental knocks to sudden drops on a desk. Durable and stable, FX705 AMD Edition has been pushed to the limit to ensure only the very best for gamers.